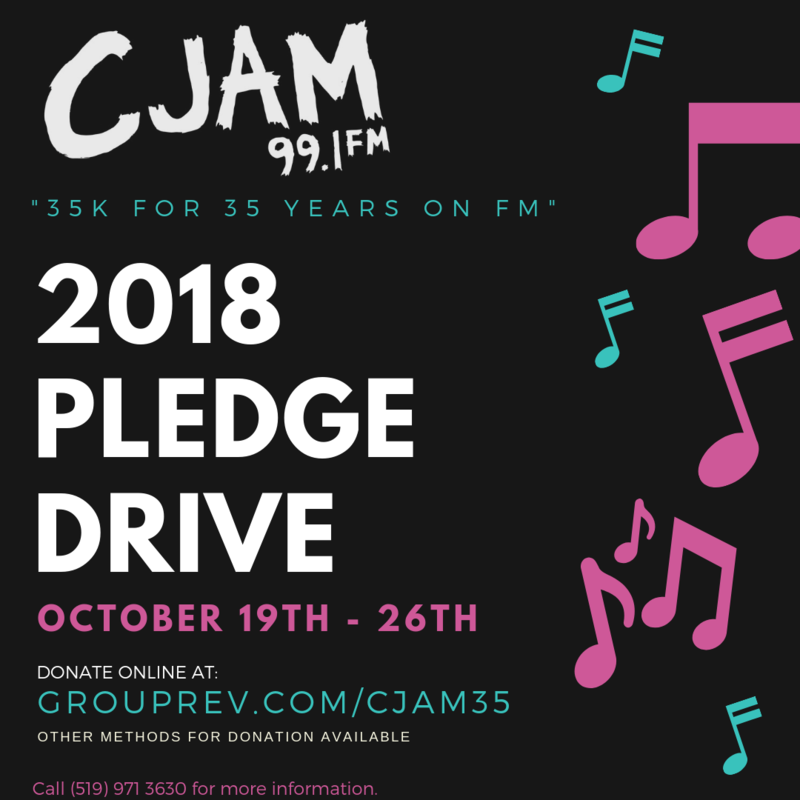 CJAM 99.1 FM is excited to announce the dates for their annual Pledge Drive Fundraiser. The drive will begin on Friday October 19th starting at 12pm and run until Friday October 26th at 1pm. It is the only time of year CJAM reaches out to the community for financial support to continue daily operations at the station. This year, the station is celebrating 35 years on the FM dial as independent non-commercial radio, giving a voice to underrepresented artists, viewpoints, and cultures. CJAM 99.1 FM is a non-profit campus-community radio station located at the University of Windsor. CJAM has been broadcasting since 1983, providing music and information programming not offered by mainstream commercial media. “For 35 years, CJAM has featured a wide variety of programs, while also providing numerous resources and opportunities for youth and the community. We’ve partnered with student volunteers to expand our programming even further,” states Brady Holek, Station Manager at CJAM 99.1 FM. Program partnerships with student life such as the law department’s Magna Carta Pro-Bono Students, the nursing department’s No Scrubs and the science department’s new spoken word program Peer Reviewed are just a few examples of shows that highlight the station’s ever-growing program base that has been a launching pad for careers in the music industry, journalism, and sports broadcasting. “We have had Jammers go on to work for SOCAN, CBC, Bell Media, and plenty more. It’s incredible seeing our Jammers succeed and we want to continue to support them and provide those opportunities,” says Holek. This year, CJAM is offering the following prizes at different donation levels. 1-855-344-2526 (toll free from Detroit and around the world). Donations are also accepted online at www.grouprev.com/CJAM35 via a secure online donation system.